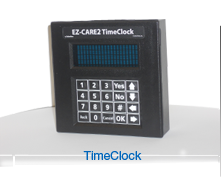 The TimeClock™ module records arrival/departure times, improves communication with parents and staff, and provides secure access to your childcare facility. This fully-integrated module automatically updates child and staff attendance records for reporting and billing, and can be used with a variety of interfaces and devices. Not Your Average Childcare Time Clock System! This easy to use, multi-functional module seamlessly integrates with EZ-CARE’s daycare software, providing a professional and convenient solution for tracking attendance, communicating with parents and staff, providing account information, and more! Communicate with staff and parents using TimeClock’s messaging and RSVP features! 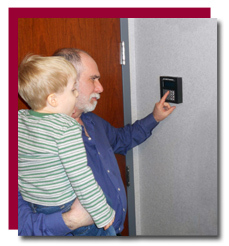 The Daycare TimeClock supports touchscreens, keypads, remote data terminals, key fob readers and other devices. We can help you choose which option meets your needs. 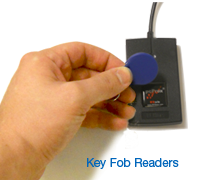 For additional security, the Door Release option can be added to TimeClock to provide a cost-effective access control system. You can eliminate the need to “buzz” visitors in while giving parents peace of mind. Our advanced daycare attendance software not only provides accurate attendance records for children and daycare staff, but the TimeClock software also provides message delivery, access to schedules and ledger information, and even parent responses to questions via its innovative RSVP feature. *For best performance, a wireless network is not recommended.